The forgotten life of Dixie Lee Crosby is often overshadowed by her famous husband Bing Crosby. It is hard to believe, but Dixie Lee Crosby would have been 100 years old this year. Dixie Lee, formerly Wilma Wyatt, was born in Harriman, Tennessee, to Evan and Nora Wyatt on October 4th, 1911. Wilma was undeniably gorgeous and talented. She won a singing contest in Chicago which included a part in a Broadway play. She was soon on her way to Hollywood and at the age of eighteen, she was signed to a contract with Fox. When Bing and Dixie met, she, indeed, was the bigger star. Even after the marriage, Dixie continued in movies. Despite her beauty, she was a pretty forgettable actress. 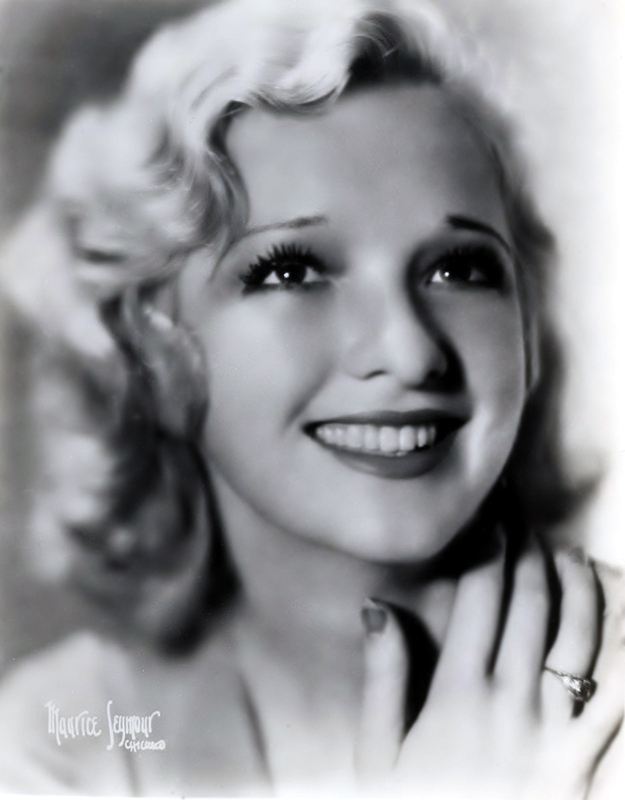 The movies she starred in are largely as forgotten as her acting was like: HAPPY DAYS (1930), MANHATTAN LOVE SONG (1934) and her last movie REDHEADS ON PARADE (1935). However, Dixie did have a successful record in 1936 when she recorded a duet with Bing of the songs "A Fine Romance" and "The Way You Look Tonight". Hearing her sing with Bing makes you wish she made more recordings during her short Hollywood career. 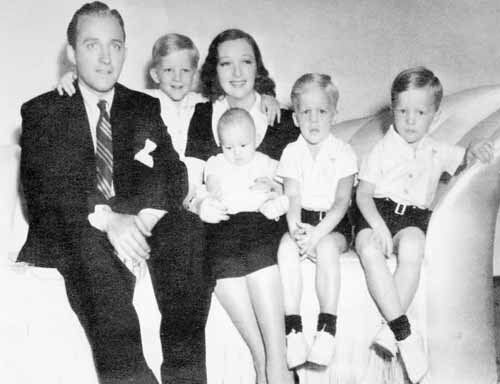 As Bing's stardom rose to superstar status in the 1930s, four boys arrived in the Crosby household. Gary Crosby arrived first in October 1933, the twins, Phillip and Dennis came along in 1934, and Lindsay rounded out the bunch in 1938. However, despite her husband's fame and the four boys, Dixie was very tortured with what modern doctors would diagnose as depression. In the 1940s, Bing Crosby was one of the most recognizable men in the world, and with this fame he spent more and more time away from his family. As a result, Dixie was turning more and more towards alcohol. I have heard many times Bing Crosby was not a nice man. I wonder what living with him was like? She was so pretty and looked like she had a kind face. No one will ever know about their married life. Lived in the house where Dixie Lee was born. Her fsther would come back to visit his relatives there and always came by to see all that my Father had done to the house. His last words on a Sunday many years ago, he told my Father it was a wonder what he had done to the house and wished that Dixie Lee could see it now. They still have quite a few relatives that still live in Harriman. Yea I think Dixie was ashamed of her southern TN roots. My Great Aunt Mattie Bell Hudson was so proud of Dixie. She kept a autographed picture on her bedroom wall. Dixies mother Nora was my great aunts Sister. She was so proud of her. My great aunt was so proud of Dixie. Aunt Matt kept a autographed picture in her bedroom . I grew up hearing how she was her niece. Dixies mom Nora was her sister. That must have been quite a long time ago for her father to be alive because she was born in 1911. Dixie was a first cousin to my father, Keith Wyatt. He was 15 years younger than her. My dad was a singing prodigy and spent much time at their home in Holmby Hills and their ranch. Do you know if anyone has done a Wyatt genealogy? My great great grandmother was a Wyatt from the same family. My father James Ward (Jamie) said he was a cousin to Dixie Lee. He was born in Knoxville in 1926. He died in 2006. His patents were Rose and William Phinas Ward. He had one sister, JoAnne. Not sure how he fits in to the family dynamics. Does anyone know him and how he was related? I am told my grandmother, Mary Louise Cox, from New Markey TN was a cousin to Dixie Lee. Can anyone confirm this? It was Christmas Eve, 1952, and I, newly arrived in the Los Angeles, California, area, was invited by my friend Stumpy Brown to join him and his brother Les' caroling group's visit to Bing Crosby's home, where the group sang for Bing, his sons, and guests around a huge holiday tree topping the high ceiling. After the caroling, I visited the powder room where Dixie's monogramed hand towels were displayed, and, because she'd quite recently passed, somehow I felt her presence quite strongly. Bless her heart and spirit. I used to see Gary Crosby around the Bel Air Country Club in the late seventies. He seemed low key and answered one of the employees one day who was asking for an autographed pic of his dad by saying "you've probably seen him more than I have lately". I read Gary's Daddy Dearest book later and concluded that a careful reading of the book exposed Gary's laziness and lack of discipline. Like all sociopaths he tried to blame it on Bing when in fact in his own words he unknowingly indicted himself. He treated Louis Armstrong terribly who only took him on tour as a favor to Bing. These Crosby children were perfect examples of the curse of inherited money and position. Sept 24,2014 I will be donating in memory of Dixie Lee a hand sketched framed picture of her to the Princess Theatre in Harriman. I feel it's time she is remembered in her city of birth. My heart goes out to Dixie Lee Crosby, and also to her sons. It had to be hard living in the shadow of a very, very famous man. Getting married at 18 was problematic in and of itself. He must have had the hots for her, that's for sure. He, being older, should have known better, but, he selfishly didn't give her the chance to have a college education, or to begin to build her own career. They met when she was 17, by 18 she's married, and a few years later, she's popping out babies about every year. It is normal to experience depression after having a baby. Postpartum is what it's called. Being in her young 20's, Bing away making movies and albums and radio shows, etc., she more than likely turned to alcohol then. Going to parties, Hollywood style, didn't help matters any either; for her or for Bing. They both drank incessantly! She somehow made him slow down a bit, but, for whatever the reason, she simply could not. They found her collapsed in a drunken stupor many times. They had doctors coming to her privately to talk with her and help her; and sometimes this would help, sometimes not. Mostly, not! During the adolescent, and teen years of the boys, Dixie had to feel abandoned by Bing, for those were the years he was sky-rocketing in his movie and music career. He had to gone more than he was there. She had help with the boys, of course, but, she still felt the primary responsibility for mothering them, and caring for them. She went into deep, dark depression, and I believe the boys did, too. She handled (or thought she did) her depression with alcohol, and probably drugs, too. It is not known how the boys handled theirs. Maybe they were also drinking, too. Looking at the divorce rate of each of their sons, it clearly shows that they were "clueless" as to how to love someone. This is understandable. Bing didn't know how to love Dixie. Dixie had no one around to show her love to, except her "bottle." So, the boys grew into men who knew nothing of love. They had to scratch theirs heads many times, and even hold back their comments, whenever the public showed so much ADORATION for their dad. Especially when he was winning accolades for being the "BEST FATHER FIGURE" in America! There are many reasons to cry for Dixie and her family. I am sorry you have such a negative view of Bing, Dixie, and their four sons. My view is quite the opposite. The four sons spoke lovingly of their mother, along with memories and stories of her sense of humor and beautiful voice. Shy, yes. but I was told she could clear out a room in a matter of seconds if someone got out of line. Your comments about the boys growing into men who knew nothing of love........you couldn't be more wrong. I had the most loving, kind, non judging, funny, courageous, talented husband. My two sons and my two step-sons had a loving, caring, supportive, hands on father, His three brothers were my brothers- in-law for over 20 years. They also were charming, talented, loving, funny, and caring. We all spent a lot of time together. All of us with our children and other cousins, aunts uncles,,,,you know...family. Were there ups and downs, of course. Twenty years is a long time. I know how very much I was loved and how Lindsay loved his children. He got that from someone or he could never have shown us the love he did. He got it from his parents. I saw this same gift of love in my brothers in-law. Especially, Gary. He was a terrific uncle to our boys and they loved him in return. I saw one of the most touching and loving moments between Gary and Bing one afternoon. A perfect moment between a father and a son. And it was over a pair of slippers. There are so many people wanting to tell sad sad tales and hateful tales and everyone's views and opinions on gossip, mostly. Non of it is at all like it really was. The Crosby family was and is just that. A family. I still love my sisters in-law and see them often. Same with my nieces and nephews and cousins and Lindsay's cousins and nieces and nephews. One thing we all did together was laugh... a lot. Bing and Dixie gave them fabulous senses of humor and natural wit. I understand from the brothers that Dixie was the true love of Bing's life. So don't cry for Dixie and her family. I bless her every day for the joy and love and wonderful family I married into. Too bad no one wishes to write or read all the good stuff. Gossip and half-truths and lies sell better. What a beautiful woman Dixie was and it is that beauty she left in grandchildren and great grandchildren that I get to see all the time. By the way, I think Bing was a good father and a loving one. That was what I witnessed. Wow, what a great recollection. I would like to set the record straight and write a story about your recollections. If you would want to, please email me at dlobosco@verizon.net. Just like with rumors about Bing Crosby, I would like to set the record straight for his sons as well. Thank you for your interest in the truth. I will contact you. Thank you for sharing your memories. My dad was a musician in Hollywood, fellow Decca recording artist, and colleague of Bing Crosby. When dad played and sang at Bing and Dixie's parties, around 1948-1952, Bing would send a case of champagne over to our house and a note, "Thanks for helping me celebrate, Bing." My parents were close to Dixie Lee. We used to have supper with them at Rogers Ranch Club, near Palm Springs, CA at Twenty Nine Palms. (I don't know if it still exists today.) Unfortunately, I don't remember these supperss. I was four years old, but I was told I had a grand time. Bing said to his wife, "Honey, why couldn't we have had one of these instead of all boys!" I do have some photos which I treasure. Again, thank you. We don't often get to hear the good side of Hollywood parent/child relationships. I'm extremely glad that the relatives of Bing and Dixie, have put the record straight. People will believe the worst,and never the best of people they don't even remotely know. Gary's fanciful fable about his Dad, was put to rights by Lindsey. Nice to see the relatives come forward. rob - but i read lindsey also committed suicide and had talked about how abusive his dad was. Thank you for sharing your beautiful memories. It seems quite unfair to EXCORIATE your family members after they are gone, But each child will have a different take on their particular relationship with each of our parents. One commenter suggests that Bing was older and he basically kept Miss Dixie from getting a degree. Hardly. A husband a few years older was considered a very good catch because of their stability.A woman marrying at 18 during those years was very common and having children right away was also very common. She was an astoundingly beautiful woman who's humor shines through her very kind eyes. All marriages have their specific issues and every family has it's tragedies. Bing was greatly beloved as was Dixie by those who loved them. In the final analysis, that is the most important. I too, am a native Tennessean. I am proud to know about Dixie, another native daughter.I did not know either of their histories since both were old enough to be my grandparents. There a certain charm unique to Southern Women. Dixie may have been ashamed of her Southern roos, as someone suggested, but the Volunteer State is one of the best! Come visit us sometime. We will cut a new hole in the privy just for you'uns. I'm not sure where you get that she was ashamed of her Southern roots. Have you read the letter she wrote to the Knoxville News Sentinel in October 30, 1930? She speaks very fondly of East Tennessee. She actually did come back to visit her relatives in Lenoir City when she was around 12 years old and she and Bing had planned on returning for Harriman's 50th Anniversary in 1941, but their schedules kept them from doing so. My Aunt Bernice (Fredman) worked for Mrs. Crosby as her private nurse. When her son was born, Mrs. Crosbie gave my aunt a crib. The crib was passed down through the family. I am a Crosby family member. My mother knew Dixie well and said she was very generous and kind to her. My father grew up with Bing & Dixie and use to play cards with her weekly as a boy and was very close. The Crosby family come from a strict Irish Catholic roots. Bing's mother was the Matriarch of the family and everyone followed what she said and wanted including Bing. So with those values hard work was an important component. I always wondered since Dixie was drinking at the time of the births of each of her children that they had Fetal Alcohol Affects. If you look at the symptoms, interpersonal problems, poor work history, mental illness and a very high incident of suicide. Two out of four of Bing's sons committed suicide. So, with this birth defect and no one knowing about it at the time, I can see the clashes between Bing and his sons as they got older. The work ethic wasn't there and that seriously frustrated Bing (a self-made man). The raft of Alcoholism.